Between midnight and noon on Super Tuesday, race and discrimination was the most discussed topic on Facebook regarding the election from users across the country, and Republican Donald Trump was the most discussed candidate. The topic of race differs from data leading up to Super Tuesday, which showed Christianity was the most discussed topic on Facebook nationally. Christianity moved down to second place once March 1 began. This might reflect the flap over Trump&apos;s refusal to disavow the Ku Klux Klan and its former leader, David Duke, who endorsed the businessman late last week. Also on Super Tuesday, guns were the third most discussed, then immigration, Benghazi, education, Islam and Muslims, #MakeDonaldDrumpfAgain, crime & criminal justice and jobs. President Barack Obama&apos;s nominee to head the Food and Drug Administration is facing friendly fire, with Democratic presidential candidate Bernard Sanders and Massachusetts Democrat Edward J. Markey both placing a hold on the nomination. Sanders said Tuesday that Robert Califf, currently serving as deputy commissioner at the FDA, is too closely tied to the pharmaceutical industry. Califf ran a research operation while at Duke University that received funding from that industry. "At a time when millions of Americans cannot afford to purchase the prescription drugs they require, we need a leader at the FDA who is prepared to stand up to the drug companies," Sanders, an independent from Vermont who caucuses with the Senate Democrats, said in a statement. "We need someone who will work to substantially lower drug prices, implement rules to safely import brand-name drugs from Canada and hold companies accountable who defraud our government." For a presidential cycle known for upending conventional political wisdom, one thing certainly hasn&apos;t changed: It&apos;s hard to vote in the Senate if you&apos;re campaigning across the country. Like a young(er) John McCain from 2007, Sen. Marco Rubio, R-Fla., who missed every vote last week, leads the Senate in truancy for the year to date, voting just 68.7 percent of the time, according to CQ Vote Watch . LYNCHBURG, Va. — It isn&apos;t every day a self-identified socialist speaks to a mandatory assembly at a college that has counted the "total rejection of socialism" among its values. But Sen. Bernard Sanders received a cordial welcome at Liberty University, even if the independent from Vermont seeking the Democratic presidential nomination faced a crowd where the most raucous applause came when he was asked why his concerns for children didn&apos;t extend to those in the womb. "I do understand and I do believe that it is improper for the United States government or state government to tell every woman in this country the very painful and difficult choice that she has to make on that issue, and I honestly, without being too provocative here, but very often conservatives say you know, &apos;Get the government out of my life. I don&apos;t want the government telling me what to do,&apos;" Sanders told an estimated crowd of 12,000. "But on this very sensitive issue ... my view is I respect absolutely a family that says, &apos;No, we are not going to have an abortion.&apos; I understand that, I respect that, but I would hope that other people respect the very painful and difficult choice that the women feel they have to make." On a day new polling showed him pulling ahead in Iowa, Democratic presidential candidate Sen. Bernard Sanders was at the Capitol, pushing to cut prescription drug prices. The independent from Vermont who caucuses with the Democrats was joined by Rep. Elijah E. Cummings, D-Md., to unveil a wide-ranging overhaul of policies regarding the pharmaceutical business, including transparency requirements, a proposal to end the practice of "pay-for-delay" patent settlements and Medicare price bargaining. As Sen. Bernard Sanders is inspiring some to “#FeelTheBern” of his candidacy for the Democratic nomination for president, his leading rival, Hillary Rodham Clinton, might be feeling a bitter Northeastern chill. TAKOMA PARK, Md. — Thousands of "house parties" gathered throughout the country Wednesday night to collectively #feelthebern. Huddled in living rooms, basements, coffee shops, libraries and anywhere else they would fit, more than 100,000 people united for the change they&apos;ve craved since at least the last Bush administration. They started as strangers, but they left as a fledgling grass-roots campaign network for 2016 Democratic hopeful, Bernard Sanders. In Takoma Park, the liberal bastion of Montgomery County, a predominately white group of approximately 30 Bernie enthusiasts of mixed age, gender and sexual orientation sat around TVs in a picket-fenced home, listening to the 73-year-old independent senator from Vermont. Perhaps Sen. Bernard Sanders should adapt a line from a former New York gubernatorial candidate and declare he thinks the cost of cable television is too damn high. 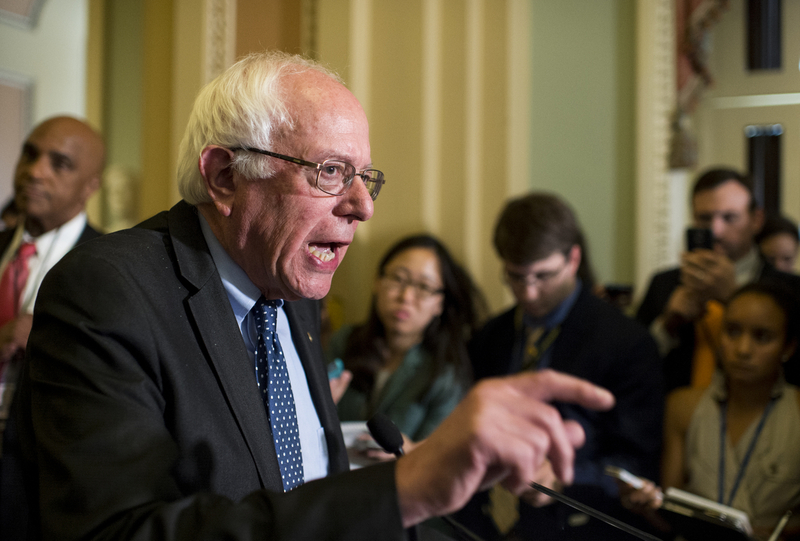 Four senators led by Sanders, the independent from Vermont seeking the Democratic presidential nomination, want the Federal Communications Commission to probe high prices for satellite and cable TV services, as well as broadband Internet.